Some business owners struggle with establishing confidentiality agreements in California. As a business owner in California, you need to stay up-to-date on the new non-disclosure agreement rules and regulations. After all, maintaining an appropriate non-disclosure agreement along with a non-compete protects your company’s trade secrets. To keep your sensitive information safe, read on and learn the top employee confidentiality agreement California considerations. Firstly, understand that there are language requirements for employee confidentiality agreements in California. When creating your agreement, use specific language as per your lawyer or legal solicitor. If one of your employees fails to comply with your agreement, you have the right to take them to court. However, if you do not use specific enough language in your agreement, you will not win your court case. As a result, you will lose any sensitive information that was stolen from you. To protect your intellectual property, build your confidentiality agreement California using the appropriate language. To protect your assets, carefully define what “confidential” means to your company in your confidentiality agreement California. 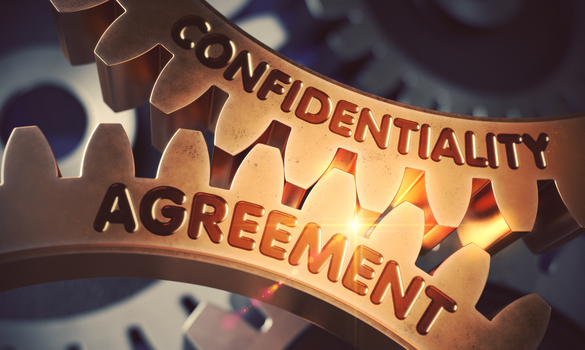 Many business owners believe that when they use the word “confidential” in their non-disclosure agreements, the word speaks for itself. After all, it is a commonly used word that can be found in any given dictionary. Contrary to their belief, the court of law does not see it in this way, especially in California. Certain companies guarantee themselves protection by indicating that all confidential assets will be labeled as such when provided to employees. By including this in their confidentiality agreements, they avoid playing any guessing games with their workers. In California, you must also pay careful attention to inevitable disclosure when writing your confidentiality agreements. While some states may comply with documents written using the inevitable disclosure doctrine, California does not. If you base your agreement off of trade secret misappropriation, you will lose a court case regarding intellectual property protection. More so, plaintiffs cannot use the inevitable disclosure doctrine either. To keep your agreement applicable in court, refrain from relying on the inevitable disclosure doctrine. Another consideration when creating your confidentiality agreement California is government communication. In the past, many businesses in California established non-disclosure agreements that did not allow governmental communication. If an employee were to provide a government official with a company’s confidential information, they would be breaking the contract they signed. As a result, their employer would sue them and ultimately win the case. Today, you cannot prevent employees from communicating with government officials about sensitive business information. California considers any statements that dismiss communication invalid. Therefore, do not include such statements in your confidentiality agreement. Finally, understand how the state of California views third party involvement in confidentiality cases. If a third party offers your confidential information to someone else, the person receiving the information is not responsible for it. When such recipients move onto transfer the information to others, you cannot sue them. Companies who include third party involvement responsibilities in their confidentiality agreements waste their time writing them in. Save yourself your valuable time by refusing to include third party involvement in your non-disclosure agreement in California. Avoid confidentiality agreement California complications by keeping the right factors in mind. Use the appropriate language by getting as specific as possible. Clearly define what “confidential” means in your business setting. Refrain from relying on the inevitable disclosure doctrine when building your agreement. While the state did not require government communication to be allowed in the past, it is required now. Additionally, law officials disregard situations involving third party situations. To safely conduct business in California, keep these confidentiality agreement factors in mind.